When the tide gets really low in a secluded cove in La Jolla, the dorsal fins of leopard sharks loom menacing out of the water – sometimes, a hundred at a time. Wading into the water, you’re advised to swim towards murkier waters, since the sharks prefer them. Despite knowing leopard sharks are harmless, the sight of their 8 feet long bodies darting through the shadows is still way too close for comfort. Yet, they truly are harmless. They are timid, and their teeth are small. Being bottom feeders, they eat crustaceans, shrimp and bony fish, but they still look disconcertingly shark-like. They are incredibly graceful, though, and the rosettes blooming along their sides make the origin of their name apparent. They swim closer to shore from June to December, and since their numbers peak between August and September, tourists visiting San Diego over the summer often snorkel out to see them. The sharks in La Jolla are usually pregnant females, and their appearance coinciding with warmer waters has led scientists to believe the warmth helps with gestation. But why are they always here? Every year, they return to the same cove, a form of aggregation behavior broadly known as ‘philopatry’-- the “tendency of an organism to stay in, or return to, its home area”. Research suggests these sharks exhibit ‘natal philopatry’, which is “the likelihood that individuals breed at or near their place of origin.” Several animals do this, with the most famous example probably being turtles: female green turtles return to the same beaches throughout their lifetimes to lay eggs. Other sharks exhibit philopatry too: for example, the Pacific great white shark, the charismatic poster child for the man-eating monsters of the sea. Electronic tagging and genetic research have made it obvious that these sharks have a very predictable migratory cycle, which really helps with conservation. Though Great whites are currently listed as Vulnerable by the IUCN, recent promising reports suggest that populations of great whites are rebounding, and although this is terrible news for sea otters (their preferred snack), it isn’t bad news for us, despite everything we’ve subliminally absorbed from the media over the years. It’s disheartening to realize that the apex predators of the ocean need our help to survive. The great white is lucky: its prevalence in movies, and its classic ‘terrifying shark’ appearance make it a darling of the public eye, doubling efforts to protect. Leopard sharks are lucky too: although they are one of the lesser known sharks, they are classified as Least Concern. However, 17.4% of all the world’s Chondrichthyans are classified as threatened by the Red List of the IUCN (j)(k). They are a class of fishes with skeletons made of cartilage instead of bone, and include two subclasses: the Holocephali (with the incredibly cool common name of ‘ghost sharks’), and the Elasmobranchii, which include all sharks, as well as rays and skates. The sharks belong to the clade Selachii, which includes over 470 species. In fact, over 200 of these new species have only been described in the past decade! They range in size from an adorable 17 centimeters (the dwarf lanternshark, only found in the deep sea), to approximately 12 meters in length—the whale shark, the biggest fish in the sea. The earliest known shark dates back to over 420 million years ago, and evolution has perfected their status as predators. Their cartilaginous skeleton is lighter than bone, helping them swim through water quicker, and their teeth, affixed to their gums instead of their jaws, are constantly being replaced throughout their lifetimes, keeping them as sharp as possible. Their jaws aren’t attached to their skulls, but in order to cope with the stress of their diets, instead are reinforced by a mosaic of calcium salt crystals known as “tesserae”. Although they generally only have one layer of this, larger sharks such as bull sharks, tiger sharks, and (of course) great white sharks can have several layers, depending on their body size. Their skin is covered in small scales known as dermal denticles, which reduce drag and enable them to swim faster. 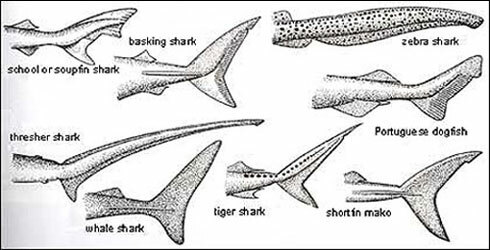 Even their tails help: the unique shape of each shark tail serves a different purpose. Tiger sharks have large upper lobes, which allow for slow cruising and bursts of speed, and thresher sharks use theirs to kill prey! Yet, despite all this, it is estimated that 100 million of them die each year directly due to commercial and recreational fishing. Of these, an estimated 38 million are due to shark finning, a heartbreaking practice which only cuts off the fins of sharks and discards the rest of the animal in the water, where it is unable to swim and then drowns. Fishing in general is the biggest immediate threat to sharks and rays, and although attempts are being made to implement sustainable fishing, a lack of data (lack of species-specific catch data, limited data on long-term population trends, incomplete taxonomic understanding, limited species-specific life history data, limited assessment techniques for data limited species, etc.) makes it difficult to come up with a truly effective plan. And although this is the most obvious threat, it is not the only one. Habitat destruction due to coastal development plays a part too, as well as pollution and global climate change (which shouldn’t surprise you, since it shows up in pretty much everything). The carbon dioxide levels in the air are being absorbed by the ocean, leading to its acidification, and recent research suggests that this hinders sharks from hunting their prey, both by not being able to smell them and losing interest in them. It’s just another reason that we need to rethink our treatment of this planet. But it’s not all bad. On the 24th of September, President Obama created the world’s largest marine sanctuary in the central Pacific Ocean, and National Geographic Society announced plans to officially safeguard more than two million square kilometers of ocean by creating new marine reserves, as announced by former President Bill Clinton at the Clinton Global Initiative on Monday. The United Nations Convention on Biological Diversity aims to protect 10% of the oceans by 2020 (as compared to the 2% currently protected), and they appear to be on their way there.